← I want to upload my paper but I do not want it to be copied or printed by others,how should I do? DIB is a Raster graphics image file format used to store bitmap digital images. It is also called Bitmap Image File or Device Independent Bitmap (DIB) file format or simply a Bitmap. It is independently of the such display device as a graphics adapter on Microsoft Windows and OS/2 operating systems. To create high quality DIB files from a Word document requires you to set high color depth and bit resolution numbers. Usually, the color depth can range from 1-bit of information to 24- or 32-bits of information, and the higher the color depth, the clear the image. Basically, resolution quantifies how close lines can be to each other and still be visibly resolved. Press Ctrl+P> When the Print dialog box pops out, click the arrow on Name combo box of the Print dialog box> choose docPrint as the printer in the Print dialog box>press OK in the Print dialog box to open the docPrint dialog box. Click the disc icon on the tool bar in the the docPrint dialog box to open the Save as dialog box. Choose the highest color depth, 32-bit, in the Color Depth combo box, and select the highest numbers, 6ooX600 dpi in the Resolution combo box. 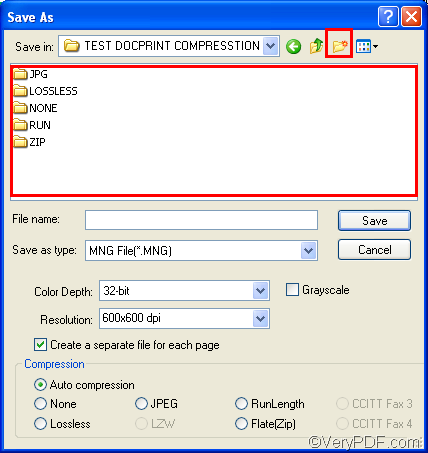 Choose DIB File(*.DIB ) as the format to create in the Save as type combo box. Click Save to create DIB files from Word document. Well can you try to create high quality DIB image files by you files now? Just following the five steps, you can quickly create a high quality DIB file from Word document. 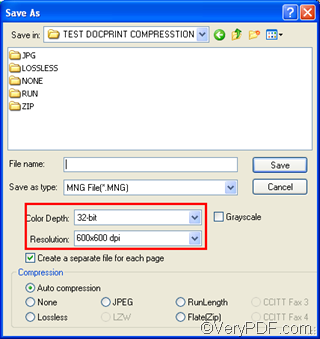 To learn more about how to use docPrint to create other image files from other documents, please read articles at http://www.verypdf.com/wordpress. To download free version, buy or get more information about VeryPDF products, you can visit http://www.verypdf.com . How to print documents of MS Office to jpg?